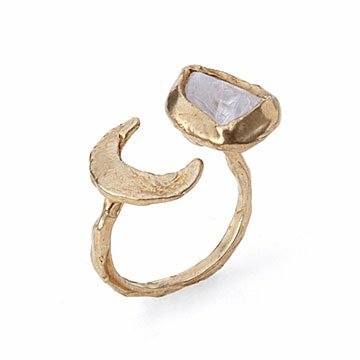 A crescent moon shares Emile Shapiro's handmade, recycled brass ring with a luminous, rose quartz "star." Displaying two lunar phases simultaneously, Emilie Shapiro'shandmade earrings embody time's infinite cycles. The raw rose quartz "star" between them is a constant glow, while the moon waxes and wanes. To make the molds for these, Emilie pressed sculpting wax against lava rocks found on a black sand beach in Maui. She embeds the raw rose quartz stones in molten, recycled brass, which hardens around the luminous stone. Together, they create an enduring, mystical mood. Gold-filled ear wires. Handmade in New York.